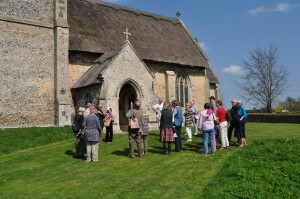 On Wednesday 15th April, about 25 members and guests went over to Mildenhall in Suffolk for an afternoon trip. We started off at the Church of All Saints, Icklingham. 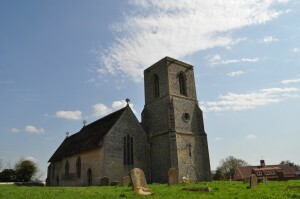 The village of Icklingham was originally two separate parishes and both churches remain. 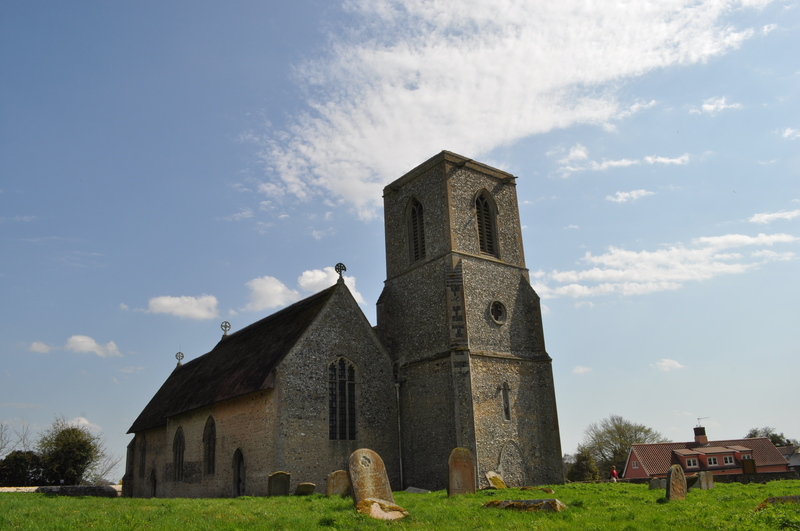 All Saints has been unused for over 100 years and is now maintained by the Churches Conservation Trust. 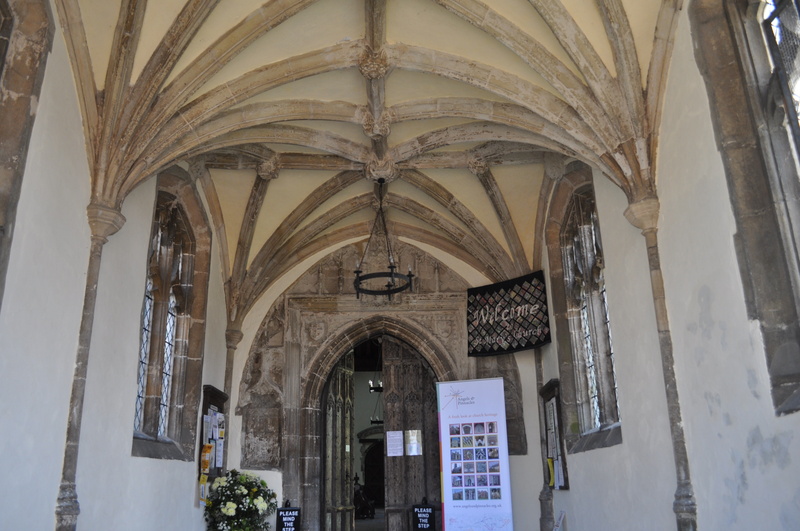 Architecturally, this is unquestionably the more important building of the two, and is one of the finest examples of an unspoilt Suffolk Church, re-built in the C14th, although it is of Norman origin. Thatched roofs cover the nave, chancel, the independently-gabled South aisle and the South porch. The diagonally-buttressed tower rises in three stages to a plain parapet and, unusually, adjoins the aisle rather than the nave. The basic fabric of the nave is probably late Norman, to judge by the vestiges of two small, blocked, round-headed windows still visible in the North wall. The interior of the church is delightful, a consequence of clear glass and the fact that the building was left largely unaltered by the Victorians. The Parish Chest is damaged, but one of only seven late C13th clamp-fronted chests in Suffolk, held together entirely with wooden pegs and tenons. The font is limestone, early C14th and beautifully carved. 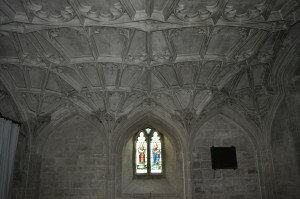 Octagonal in shape, with each side carrying a different tracery design. An Elizabethan alms box is on a wooden post by the main door. The nave has C15th backless benches (ouch). Along the tops of the north and south walls of the south aisle are beautifully carved cornices. There is some excellent medieval stained glass, showing two half-figure (saints? ), with canopies above. The 5-light East window has splendid tracery, with more carving around the niches on each side. Traces of paint here show that the stonework would originally have been richly decorated. The rood screen is late C15th and only the lower part (dado) now survives. The chancel floor is the most notable feature, being made up entirely of medieval glazed tiles. 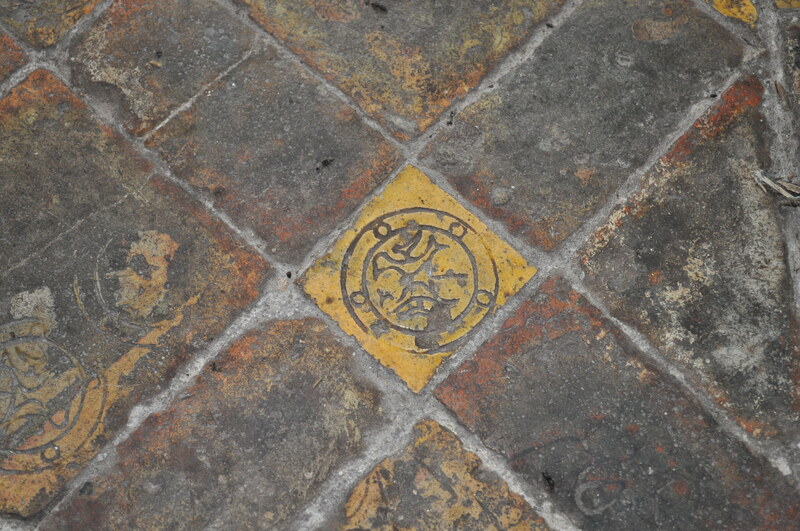 Their survival here is a great rarity, as medieval glazed floor-tiles did not wear well under hob-nailed boots and were largely replaced with pamments, unglazed bricks, harder stone or marble in the great rebuilding of Suffolk churches in the later Middle Ages. Dating from around 1325, and supplied by the Benedictine Abbey at Ely, they are either plain or line-impressed, varying in shape, colour and design to form a complex mosaic. Individual motifs include two birds facing each other, a lion’s face and an earless man wearing a coronet. Some tiles are pseudo-mosaic, in that they appear to be two tiles but are in fact a single tile. After Icklingham Church, we carried on into Mildenhall to visit the Mildenhall Museum, which received a £423,000 Lottery grant in 2012 so that it could be extended to house its great treasure – the Anglo-Saxon Lakenheath Warrior (aka The Horse Burial). The Museum also tells the full story of the discovery of the Mildenhall Treasure (and a very strange story it is) together with the history of the Town, the Fens and the Brecks. An excellent little museum in which to spend a couple of hours. Finally we went to visit the Church of St Mary, This is the biggest church in Suffolk, almost 60m long and 20m wide, with a tower 40m high. Virtually all of it is original, hardly anything is a Victorian renovation. It is a church of other superlatives; the east window of circa 1300 is considered one of England’s best (albeit now with Victorian glass). The nave roof is possibly the finest in East Anglia. There are 10 life-size angels with long robes and curly hair, holding instruments of the passion, books or musical instruments. 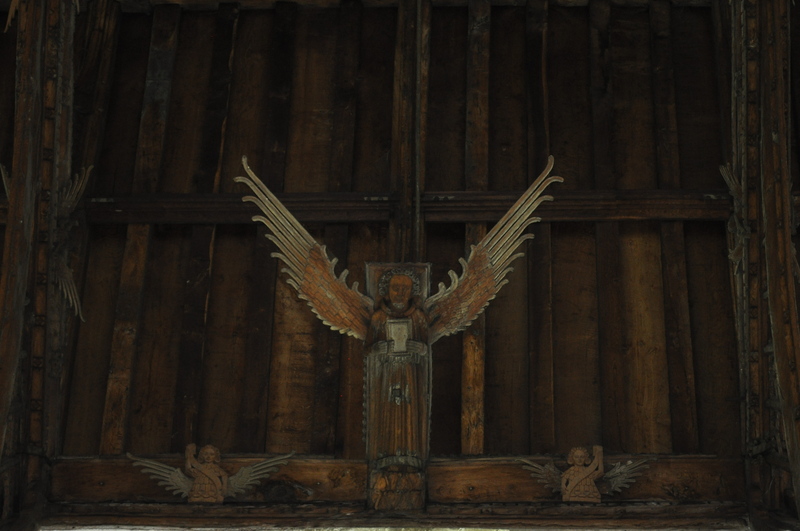 Their wings (which are inserted into grooves on their backs, with no other support) have been restored – in 1651 the parish had paid a man a shilling a day to deface “all symbols of superstition”, and the roof is peppered with shot. There are also some 60 smaller angels carved into the tie-beams and cornices. In the North Aisle there are extraordinary figures and beasts carved into the hammer-beams and the head of a Cromwellian soldier’s pike is still embedded in one of the figures. Each spandrel is a carved panel, depicting a mixture of biblical and domestic scenes, including a woman in a horned head-dress (supposed to typify Pride), a comic pig with an astonishing collar, demons playing an organ and a demon grasping a dog by its tail. 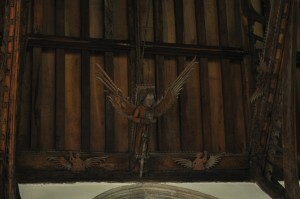 The wall posts have canopied figures, with the canopies formed by angel’s wings. 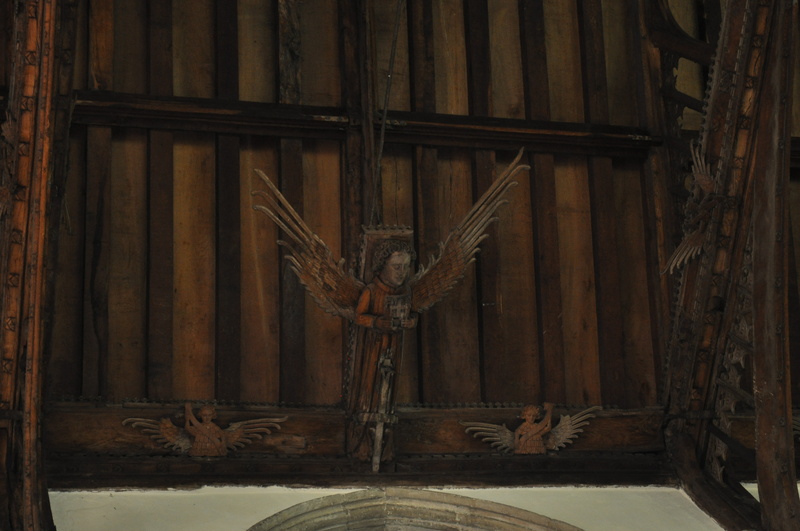 In the South Aisle , there are six wingless angels carved into the hammer-beams. 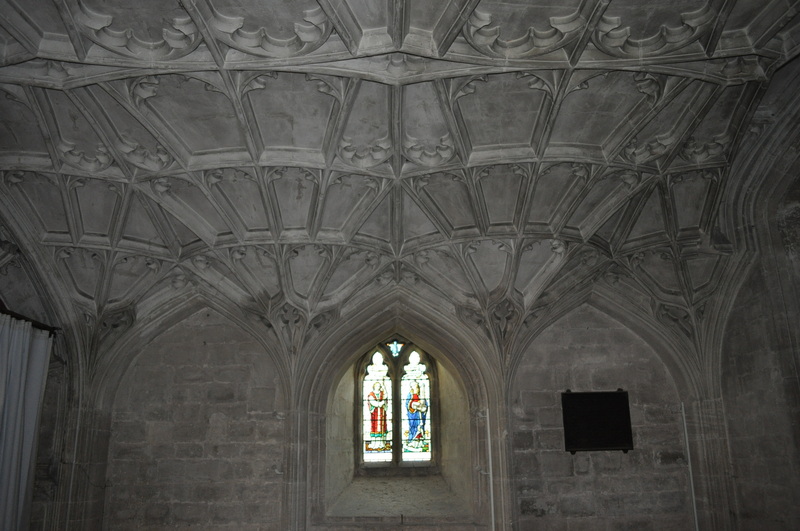 The spandrels are filled with solid panelled tracery. The carving here is less ornate than the north aisle, but 164 carvings of swans and antelopes (the emblems of Henry V) survive intact. 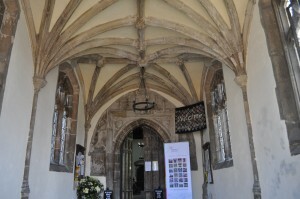 The north porch and the tower both contain excellent examples of stone vaulting.